The key consideration for the proposed changes is the more equitable distribution of the sewer rate between residential customers (whom make up ~ 90% of our customer base) and non-residential customers than under the previous rate model. The proposed amendments will complete the move to a hybrid Base Rate + Discharge Rate model similar to those used in other municipalities. The Base Rate will be based on a single family home discharging 40,000 gallons of wastewater a year. This ensure that all customers are paying a common base rate with allowance for larger users. 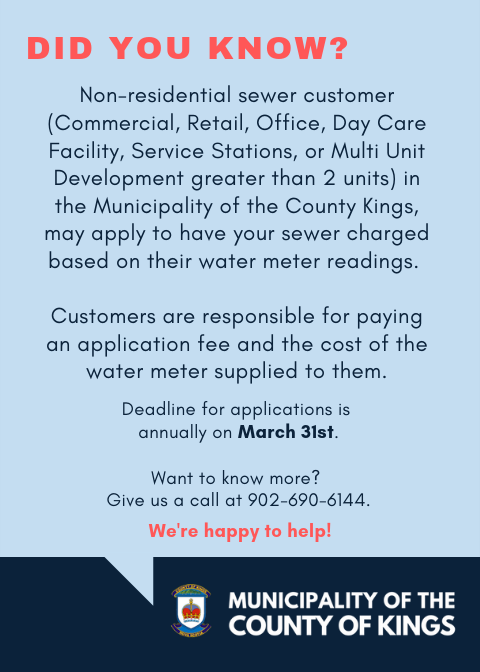 There are eight sewer treatment plants located at the following locations: Hants Border, Avonport, Canning, Aldershot, New Minas, Waterville, Aylesford and Greenwood. Of the eight sewage treatment plants, the largest is the Regional sewage treatment plant located in New Minas. This particular plant services the town of Kentville, the Village of New Minas, Coldbrook, Greenwich and a number of private industries. The users pay for the operational and capital costs of this plant under an agreed cost sharing formula. Other Municipal waste water treatment plants treat sewage from one or more communities such as the Aldershot and Waterville Sewage Treatment Plants. There is an agreement with the Greenwood Sewage Treatment Plant and Department of National Defense where the Department contributes 55% of ongoing operating costs in return for treatment of 14 Wing Greenwood sewage. In September of 1997, the Municipality opened the septage waste disposal facility adjacent to the Waterville sewage treatment plant to treat all residential/commercial septage generated in Kings County from residential/commercial septic systems and holding tanks. The network of piping and sewage lift stations leading to these waste water treatment plants consist of some 90 km of collector and force main piping. The Nova Scotia Department of Environment and Labour, the regulatory authority, requires compliance monitoring at each waste water treatment plant. Municipal Staff collect, test and analyze samples at the Regional treatment plant lab facility on a weekly basis and submit the results on a monthly basis to the Nova Scotia Department of Environment and Labour. In the case of the Regional sewage system, the industrial users are sampled on a daily/weekly basis and are used to apportion costs to each user. Daily inspections and repairs to all systems are carried out by our Staff and a 24- hour on-call system is in effect at all times to ensure the public's access. A computerized central monitoring system (S.C.A.D.A.) constantly scans each station and reports any alarms during working hours or after hours.